Tray Packers - Hamrick Manufacturing & Service, Inc. 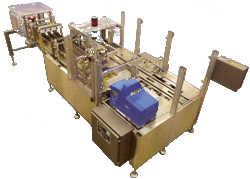 The Hamrick Tray Pack Machines can pack a wide variety of products at speeds ranging from 15-60 trays per minute. All tray packing machines are PLC controlled and come with a 100% money-back guarantee.